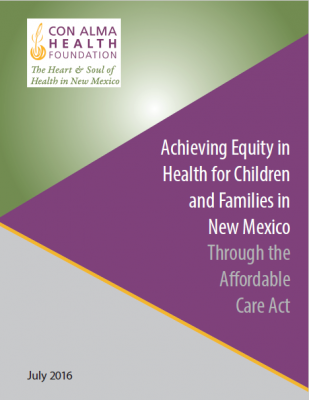 Con Alma Health Foundation released a report, “Achieving Equity in Health for Children and Families in New Mexico,” assessing how the Patient Protection and Affordable Care Act (ACA) has been implemented in New Mexico. This comprehensive study focuses on ACA measures intended to increase health equity, in which everyone has an equal chance at living a healthy life regardless of a person’s ethnicity, income or zip code. We partnered with the University of New Mexico’s College of Population Health, the Robert Wood Johnson Foundation Center for Health Policy at the University of New Mexico to conduct the study, and the New Mexico Alliance of Health Councils to ensure local communities were represented. This study and report was made possible by a grant from the W.K. Kellogg Foundation. As part of the project, UNM developed interactive maps that detail seven categories of children’s insurance coverage by county. “These maps are a useful tool for anyone interested in learning more about the insurance coverage of New Mexico’s children by such categories as race, place, gender and income,” Roybal said. To engage with diverse stakeholders across New Mexico, we held the biggest cross-sector gatherings so far in New Mexico to discuss the ACA, bringing together business and nonprofit leaders, government workers, health providers, policy makers and health advocates to discuss successes and challenges in implementing the ACA. Con Alma will continue to disseminate the report’s findings and work with partners towards achieving health equity, when everyone has an equal chance at living a healthy life, regardless of a person’s ethnicity, income or zip code. The report includes a section that emphasizes federal opportunities for leveraging the ACA in support of health equity and assesses what is happening in New Mexico. It also summarizes timelines and benchmarks of activities, and describes the successes and challenges of implementing the ACA from stakeholders’ perspectives. In February 2016, 54,865 people were enrolled in private plans through the marketplace and it’s projected that 850,000 will be enrolled in Medicaid by the end of 2016. Community health workers have been an important part of outreach and insurance enrollment. Partnerships between local communities, advocacy organizations, multi-level governments, insurance companies and the health sector are critical in assuring that the ACA works for all New Mexicans regardless of income, geography, race or ethnicity and language spoken.